It's a very long time since I was last on Rottnest Island - 1977, in fact - and it tells you pretty much all you need to know about the place that what I did today wasn't much different from what I did then. Which is a good thing. So, I took the ferry from Fremantle, or Freo, in local-speak, which whisked me there in about half an hour. They gave me my bike, helmet and snorkelling gear, and just like that I was away, skimming along quiet roads along the coast through low, wind-blown bush, scratchy limestone outcrops and past two lighthouses and a series of beaches and bays with gloriously soft, cream-coloured sand and mind-blowingly clear, turquoise water that seemed to glow under an absolutely cloudless sky. I pedalled and paddled, I stopped to look at views, I had a swim and a snorkel, and I thoroughly enjoyed the peace (no private vehicles on the island), the fresh air and the exercise. The snorkelling, to be brutally honest, wasn't that great - they're meant to have 135 species of tropical fish, thanks to the warm Leeuwin current that comes down from the north - but all I saw were boring regular fish. Mind, I didn't go very far out. "Better to be able to out-run the shark, than try to out-swim it," as a fellow lady snorkeller said. But there were no sharks - dolphins, though, and ospreys, and New Zealand fur seals panting on the rocks and feeling the heat. "They come here because the climate's better, there's plenty of food, and we have a very generous social welfare system," said the guide on the Eco Adventure boat that circumnavigated the island in 90 minutes. It was a fun ride, fast and sometimes airborne, in a rigid inflatable "designed in New Zealand, the land of adventure, but made in Freo so we know it was done properly" - such gratuitous anti-Kiwi jokes, and she didn't even ask if there were any aboard. 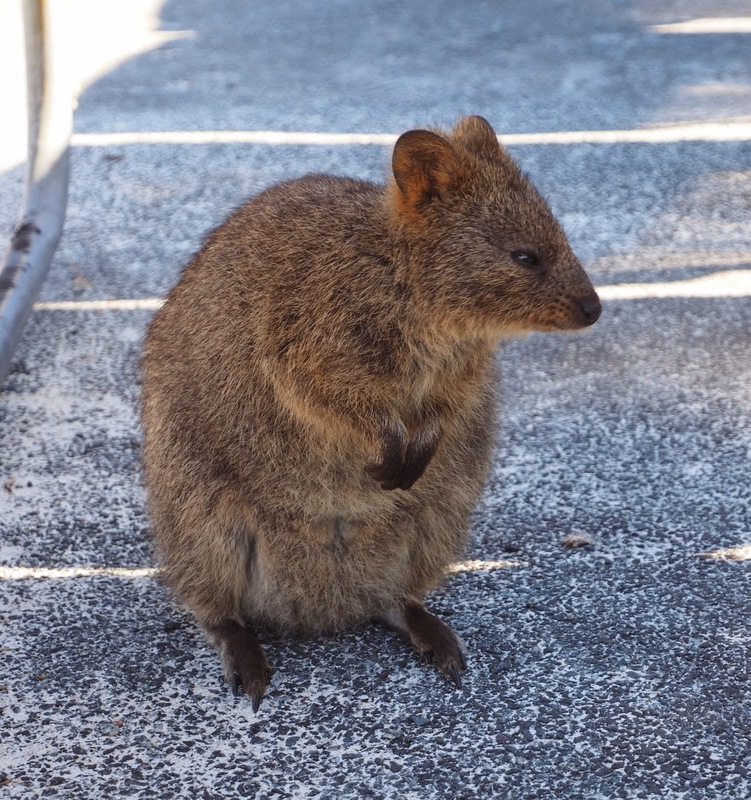 There were quokkas, of course - unique and endemic marsupial, wrongly thought by the discovering Dutch to be giant rats, hence the island's name - very cute and bold and inquisitive. I recommend the fish and chips at the Geordie Bay General Store - no ambiance, but truly excellent chips, and though of course the fish was barra (when is it not?) it was very tasty. More cycling, more swimming, and then it was time to bounce back with the Freo Doctor driving us - that's the onshore wind that picks up every afternoon and gives respite to those wilting in the city. This is where the day got messy - I certainly was, with no time for me to return to Cottesloe to tidy up before a river cruise starting at the Royal Perth Yacht Club. The organisation fell apart, I had to get into the place by slipping through the locked gate behind an unsuspecting couple with a card pass, as seen on TV, and it was a long wait before the others turned up. Artists, you know. Like herding cats. 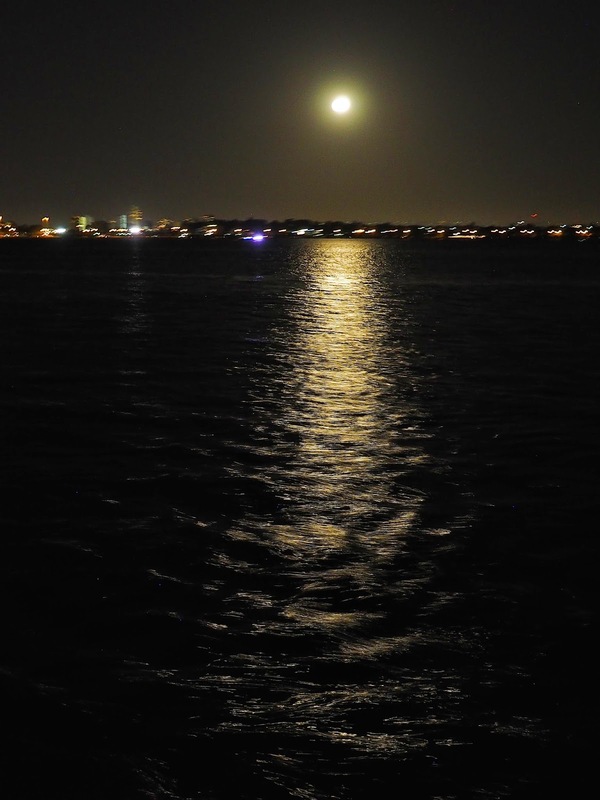 So we missed most of the sunset, but in compensation had the almost-full moon rising behind the city across the Swan River, so that was good. So was the food, and it was a very pleasant cruise - though it was a long day and I was glad eventually to get to bed.